Until recently there had been only a single edition of these quartets: No. 1 from the first volume (72M). This was by Johann André in about 1808. It is now freely available from the Petrucci on-line library as a set of parts. Unfortunately this edition differs quite substantially from the Berlin manuscripts. Why there are such differences is unclear but it is possible that there was an intermediate copy on which that André based his edition. Johann (Jean) Andr, a composer and pianist, was born in 1741 and died in 1799. He founded the publishing company in 1775/1776 which was based in the city of Offenbach am Main. After his death the company passed to his son Johann Anton Andr (1775-1842). It was during the time of this son that his edition of the quartet was made. It is instructive to compare the two editions. 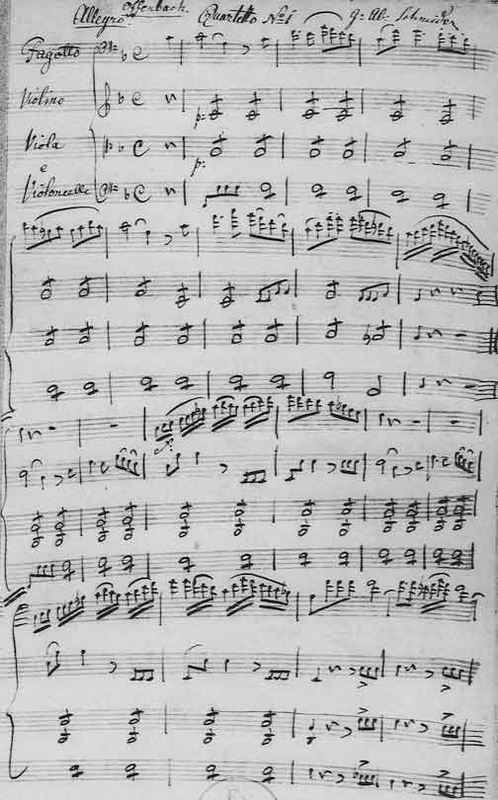 The only other indication of where the manuscript was made is on the first page of the first quartet: the word “Offenbach” appears above the first bar. It is almost certainly in the same hand as the rest of the music, which possibly indicates that it was not added later. The publisher André was located in Offenbach sur le Main (Offenbach am Main) so it probably refers to this. However, why this single quartet has this is unknown, but is is interesting that this is the quartet that was published by André. None of the other quartets in the first volume (72M) have any other note associated with them. Each quartet follows directly on the previous one rather than starting on a separate sheet. It is possible that this implies that this was not the original composer's draft—although there are in places clear indication that there has been a change of mind in the scoring. There are several points of interest here. First the number 2582 indicates that the edition was produced in or around 1808. Also there is an Opus number (43) associated with the work, but it is not clear whether André was responsible for this numbering, or whether it was intended to embrace the whole of the first volume (72M). If so then we should expect to see this reflected on the title page— that this was Quartet No. 1. The dedication was to a Mr Le Capitaine de Bredow whose identity is unknown. The original manuscript had no dedication at all so it must be assumed that this was an after-thought. Also it is not clear why André produced only this single quartet out of the 3 volumes; it only has an Opus number with no further numbers to indicate that this was the No. 1 in the first set, so we could assume that this was a “one-off”—possibly as a trial to see whether anyone was interested before completing the set. The majority of differences between the editions are articulation and dynamic additions. In places, however, there are major note and passage changes. While these might suggest that the André edition was not taken from the Berlin Manuscript, there are clues that it might have done. In many places throughout the Berlin Manuscript the copyist (or composer) has included implicit accidentals where they are not necessary—even allowing for contemporary convention. These have been faithfully reproduced in the André edition. 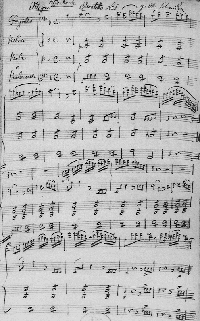 Whether both editions were following an earlier manuscript or the André copyist was slavishly following the Manuscript is unknown.